Philocrites: After you vote, check in. After you vote, check in. You're not too busy. You're not above it all. You're not insignificant. No matter where you live, no matter how gerrymandered your congressional district, you should make your way to your polling place and vote on Tuesday. (Personally, I think you should cast your vote against Karl Rove's politics of division and make the Republican Party suffer for refusing to govern from the center, to say nothing of the Republican-dominated Congress's inability to rein in George W. Bush's egregious abuses of executive power and his disastrous war in Iraq. But you don't need me to tell you how to vote. I trust your good judgment.) After you've voted — or if you've already voted by absentee ballot or by mail — come on back here and check in. What race or races do you feel passionately about? Previous: This week at uuworld.org: William Schulz on torture. Next: How did Unitarian Universalist candidates fare? As I'm out of state for a bit, I voted absentee. For me it's congress that needs to change. 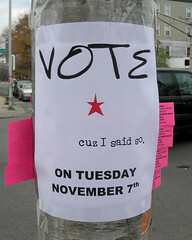 Other elections are important (congrats Gov-elect Deval! ), but it's congress that's most important. They can't steal a landslide!!!! I've already voted -- we do absentee (they count them in California). My passion tonight is my prayer for our nation, for each and every leader in it, local, state and national, of every party and affiliation. I am thankful for every one that hears the call to enter the public arena and give of themselves for the greater good of the nation. Whether I agree with them or shudder at them, I bless them all for their efforts. May they each be guided by the Highest Good to choose wisely and well, for the benefit of every American to "the thousandth generation", and for the benefit of every one in the world. In gratitude for all the Good that is ours to experience and express, I offer this prayer into Infinite Being and let it be so. Of course, there were election signs for both parties all over the lawn outside the polling place. I was tempted to swipe the George Allen signs, but good behavior prevailed. I live in a mostly one party state (Republican) - and that party is expected to sweep all the state wide races. Living in the rural part of the state, I therefore however live in a Democrat area (yep, not conventional wisdom is it?) - only one race in my local district is running with opposition - the US House. Hard to be filled with passion when you know the election is over before you vote. I am about to go out the door and walk over to my polling place. I get to vote in the up-for-grabs Claire McCaskill vs. Jim Talent senatorial race. I also get to vote on a ballot initiative concerning stem cell research. I voted in the same race as RevThom. McCaskill v Talent is the one I'm watching, along with the stem cell amendment. I'm glad to be in Missouri right now to help, if possible, nudge things in a corrective direction. Last week I phone-banked for local races (with PROMO) and, for a non-native, am pretty passionate about the local political scene. Oh, and I saw at least one person walk off before confirming their vote on the electronic machine. The poll worker nabbed them, but it makes me nervous... can the UN come in and help us? ck: western Missouri says hello to eastern. Holla! I votes and then posted about the experience at my blog. My hands are tired now. All that there is to do now is kill time until the results come in! In DC here, America's little Bantustan. The big race is for mayor, though given the large Democratic majority it is a forgone conclusion -- after a fierce primary -- that Adrian Fenty will be the next one. At 37, I have a new, unfamiliar feeling about the new mayor being two years my junior! But I think he'll be great for the city. This makes the local races to watch for some second ward Advisory Neighborhood Commission seats, each with a constituency of about 2,000 residents. The battle lines pit a multicultural mix of newer gay residents with the wildly-homophobic, church-backed black establishment. Alas, I live a few hundred yards over the line or else I'd be in that fight. Hubby and I went to vote together. At 10:30, there were about 350 having voted; not bad. There was a paper v. electronic ballot option; everyone took paper. And holla back, western MissourAH! CK, the amendment is a ballot initiative that needs only 50 votes from the legislature this year and another 50 votes again next year to go on the 2008 ballot. I think it's likely to pass that minimal, non-majoritarian hurdle this year, though I can only hope that by 2008 nobody feels like dissolving their neighbors' marriages. The Globe reports a vote is scheduled for Thursday. There's a big rally at the State House all day, and donations are always welcome! I hate voting in Chicago because there seems to be so much extra bureaucracy involved in the registration and ballotting processes. In Wisconsin, you register at the polls and away you go. In Chicago, you have to register 90 days (maybe 30, but I'm pretty sure it's 90) in advance, and then they don't bother to check your ID or voter registration card once you're actually voting. Dumb. Also, you have to vote for every judge in the county every year - but none of them really bother to campaign, so who knows what their issues are or whether or not they're doing a good job. The IL bar association provides a list sometimes, but I didn't have time to find it this morning before going to the polls. There was an interesting referendum question that I didn't know was going to be on the ballot - Should the US immediately evacuate troops and National Guard from Iraq? I'm looking forward to the results on that one. Since I'm currently out of town (visiting a sick friend), I voted absentee a few days ago. But living in Wisconsin I am deeply concerned about the proposed constitutional amendment that would make any sort of civil union for gays impossible (the constitution currently defines marriage as between a man and a woman). In the weeks leading up to the election I volunteered with Fair Wisconsin (the group working to defeat the amendment) doing data entry. Our state is also considering resolutions on the death penalty and withdrawing troops from Iraq. Democratic Governor Jim Doyle is expected to win re-election. I voted absentee, since I was supposed to be away from home for work this week. Also, I wanted a paper trail. I voted for Democrats, though I'm not entirely happy with them (no vertebrae). Also voted for gay-rights amendment to my town's charter, against the anti-affirmative action ballot initiative in Michigan, and the initiative to limit Eminent Domain. I voted, my yearly protest vote here in Utah. I voted for Ashdown, fully knowing that Orrin Hatch's sad-but-effective "Why wouldn't you vote for the incumbent--I'm powerful" strategy will surely prevail. I can only hope that when he retires, Ashdown will have name recognition. The new touchscreens are having a lot of problems here, so I'm interested to find out both the results of the elections elsewhere and the evaluation of the touchscreens. I voted...and never had my ID checked. Kinda' shady. Go Rich Whitney for Gov of Illinois! I voted at 8:30 AM today. There was no line in the polling place and I was the 26th person to vote in my precinct. We don't have a lot of decisions on our parish ballot this November ("parish" = "county" in Louisiana). We have 8 state constitutional changes to consider (this is very typical in southern state governments). There's a congressional race for the 4th Congressional District and the incumbent (Rep. Jim McCrery) is expected to win. He is running against 1 Republican and 2 Democrat opponents. If McCrery doesn't get > 50% of the vote, the top two candidates will advance to a runoff election in early December. In theory, it's possible that our district could have a runoff election with two GOP candidates or two Democrat candidates. Although Chester's campaign materials do mention other issues, his major focus is illegal immigration and this makes him sound like a very cranky single-issue candidate. I voted today in Ohio. The most passionate issue this election by far is for Governer. The call went out in Ohio this year. Evengelicals planned to recruit and have vote a million new voters. We Believe Ohio called back and said "We have a vision too! One of Love, Tolerance, Human decency." It looks like Blackwell will loose, finally something politically to be proud of my state. Though I may be eating crow in the morning. I was on my "other island" over the weekend, got up early this morning, having stayed overnight another night because of a board meeting, got on the earliest ferry I could from Port Townsend to Whidbey Island, and went almost directly to the polls to vote. I handed the judge my ID, but I don't know if she looked at it; it's a pretty small precinct and she's seen me before. I was #74 in my precinct to vote. It was still raining cats and dogs, as it has been for four solid days. I look forward to the results, too, though I haven't a clue why they would ask that or what your state could possibly do about it even if it passed. Turnout in Northern VA was huge. TheCSO was a poll worker and has interesting stories which he should put up in a day or two. Suffice to say old people and computer voting do not mesh. I voted last week in San Antonio. Surprisingly, Texas has a very liberal early voting law: early voting sites are open the 2 weeks before election day (about one early site per 20 precincts in this county), and any registered voter can vote early for any or no reason. A party activist I know used to say that Texans had a moral obligation to vote as early as possible, because if we get hit by a bus and die the day before election day, our vote still counts if we voted early. The early voting site I used was bustling. Reports statewide are that early voting numbers were higher than ever. It was my first experience with electronic, paperless voting--easy, but disconcerting. A key race here was U.S. House District 23 - the incumbent Henry Bonilla, widely opposed by progressives and community leaders, was running against 6 Democrats and an Independent. He's leading, of course, but doesn't have 50%, so there will be a run-off between him & the top Democrat. It will be tough, but we may still beat him. Voted in WI two weeks ago, by absentee ballot, since I'm regularly in IL on Tuesdays. Didn't know the results until late last night. Stunned & Appalled. I want to personally apologize to every GLBT/Q person I know, for yet another callous constitutional amendment cutting off the possibility of civil union/marriage. I did apologize to my kind weekly hosts. Such sweet guys - they comforted me! Well, on behalf of all LGBT people (caus, you know, that's what one lesbian is--a representative of all lesbians and queer folk everywhere), I accept your apology. My friends call it a "wedding" and my partner and I know what it is. Some day the rest of the world might get it, but until then, we'll just show them.